Caetano Veloso is yet another one who liked to name his albums after himself (could it be that solo acts somehow has big egos? 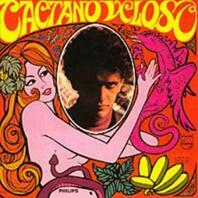 ), and this is the first of three called, yep you guessed it: Caetano Veloso. This is also another one of the albums that set off the Tropicália-movement, but if you were expecting anything like Os Mutantes you'd be dead wrong. There's more bossa nova than insanity (despite the cover-photo's psychedelia-framed aggressive stare and the intro of the song Tropicália) and I'm frankly a bit disappointed (even though Gilberto Gil co-wrote a couple of tracks on this album too). But then again, the Brazilian government were apparently scared shitless as they saw this (in my opinion very timid, but I could be extremely wrong as I still haven't learned Portuguese - for all I know there could be some Vysotskij-level lyricism going on) and a couple of more albums as a threat big enough to make them first jail and then exile both Caetano and Gilberto. Proof that even the most timid music is perceived as dangerous if society's totalitarian enough.